Television journalist James Highwood has made his career out of challenging the British justice system in his documentary programmes. Now, suddenly, it is Highwood himself who is challenged when he is brought to court on a charge of murder. 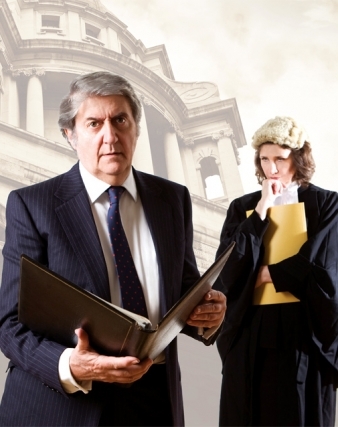 Olivier and Tony Award winner Tom Conti is one of the UK’s most familiar actors, so it’s no surprise that he turns in another accomplished performance in Terence Frisby’s courtroom drama Rough Justice. The premise of this play is an interesting and intriguing one, raising as it does a thorny and divisive moral issue regarding the murder of a severely handicapped baby. For the most part the play manages to engage and absorb the audience, but would benefit greatly from tighter dialogue and delivery. The horrific (un-amplified) acoustics of the Theatre Royal Glasgow swallow up much of the wordy discourse and several of the actors were rendered inaudible by their choice of delivery. One member of the cast also appeared to be reading his lines wholly from the script in front of him, something which could have been better disguised due to the nature of his role. That said there are some fine performances here, in particular Elizabeth Payne as barrister Margaret Casey and David Michaels as solicitor Jeremy Ackroyd. With the first night blips ironed out and the delivery tightened this has the potential be an absorbing night out in the theatre. The after curtain-call opportunity to be the jury is in itself an interesting eye-opener into the views of the populace on the moral issue at the play’s heart.